Dinosaurs—the word alone conjures up powerful images and a sense of mystery. Most children go through a dinosaur-loving period, often fueled by cartoons and movies. If your kids are enjoying such a phase now, they have embarked upon an exciting adventure, and there are many engaging destinations in Connecticut where they can pursue their Jurassic Park-like quest, whether your family enjoys science museums, amusement parks, or artistic expressions. And remember to check our Event Calendar regularly for special dinosaur-themed activities, like this week's Dino Days at Stepping Stones Children's Museum. My daughter was 4 years old when her preoccupation shifted from Barney, the purple dinosaur, to Triceratops and T-Rex figurines and stories. I remember so clearly her simultaneous delight and terror upon seeing the life-size Brontosaurus (skeleton) in The Great Hall at the Yale Peabody Museum. From that moment, her imagination soared, as did her scientific inquiry, and we've returned here many times. The museum will greet you with a 21-foot bronze Torosaurus from the moment you see the building. Once inside, its extensive collection of fossils and reconstructed skeletons (and, of course, gemstones, birds, and animal dioramas) will impress and educate even the youngest visitors. Admission is $9 for adults; $5 for children ages 3-18. From September to June, the museum offers free admission on Thursdays between 2-5 p.m. Kids love spending the day here, getting up close to more than 40 life-size dinosaurs, including moms guarding their nests and babies, or roaring giants (might want to warn little ones) near a volcano. Even on a hot day, the 1.5 mile wooded trail will keep you mostly in the shade, and afterwards you can cool off on the area's largest splash pad (safe for all ages since water does not accumulate). The fun includes mystery touch-and-feel boxes, outdoor fun digs, a maze, and a playground. Summer admission prices begin at $19.99 (plus tax) for ages 2-59. You can customize the experience by purchasing additional activities, such as crafts, geode cutting, and bone digging. You will not find life-size models here, but the floodplain imprinted with hundreds of fossilized dinosaur footprints is really impressive. Informational placards and hands-on activities will keep the kids entertained, as will the Discovery Room's collection of minerals, fossils, and more. You can also pack a picnic, complete a nature I Spy game, or bird watch while walking the serene trails. Trails are free. Admission to the Exhibit Center is $6 per adult and $2 for children ages 6-12). From June through August, 40 dinosaurs are playing hide and seek in downtown Stamford, and kids can have a lot of fun trying to find them (and like any scientists, you might need a reference map). Part of the city’s annual outdoor sculpture exhibit, Arts in Public Places features sculptures lining sidewalks and parks downtown, as well as the Stamford Town Center. The 2015 display is FREE and features originally designed and painted fiberglass dinosaurs. Go find them before the exhibit becomes extinct! Parking garages found on Atlantic Street, Bell Street, and Washington Blvd. As if roller coasters and gushing water slides do not provide enough excitement, now there are dinosaurs residing in America’s oldest amusement park. Dino Expedition, a prehistoric themed area, is new for 2015. Guests will enjoy strolling through the past and discovering moving and breathing lifelike dinosaurs. Along the way, learn facts and trivia about these majestic creatures, and an open-air fossil dig allows even the littlest paleontologists to unearth fossils. 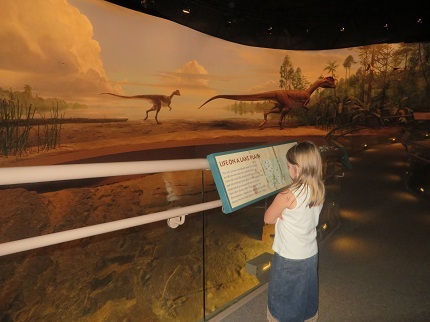 Dino Expedition is free with daily admission ($40.99) or season passes. The dinosaurs have returned downtown. Look up at a 37-foot Omeisaurus and let a 47-foot T-Rex look down upon you. The EXTREME Dinosaurs exhibit will delight and educate visitors of all ages with 22 life-size animatronic dinosaurs in their habitats, and many hands-on activities involving fossils, skeletons, and much more. The exhibit is free with the purchase of general admission (begins at $14.95 for children) or membership, but the dinosaurs are moving out at the end of the summer, so you better hurry. About 10 minutes further north in Holyoke, MA, you will find Dinosaur Footprints, home to hundreds of footprints left by dinosaurs reaching 20 feet in height. In addition, more than 20 trackways sprawled here support the theory that dinosaurs traveled in groups. These historical treasures are found along an easy trail parallel to Route 5 (roadside parking is available); the property is open to the public from April through November. Admission is free. Have a roaring good time!